Metro has proposed new possible locations for the temporary cooling tower needed to return the system’s equivalent of air conditioning to the Farragut North and Dupont Circle stations in the next few weeks. WASHINGTON — Metro has proposed new possible locations for the temporary cooling tower needed to return the system’s equivalent of air conditioning to the Farragut North and Dupont Circle stations in the next few weeks. An agreement with the District Department of Transportation on where to put the temporary tower could come “any day now,” General Manager Paul Wiedefeld said in an interview Thursday, and riders should not expect to be sweating it out all summer. The agency ran into problems getting a permit to use the same spot as last year. 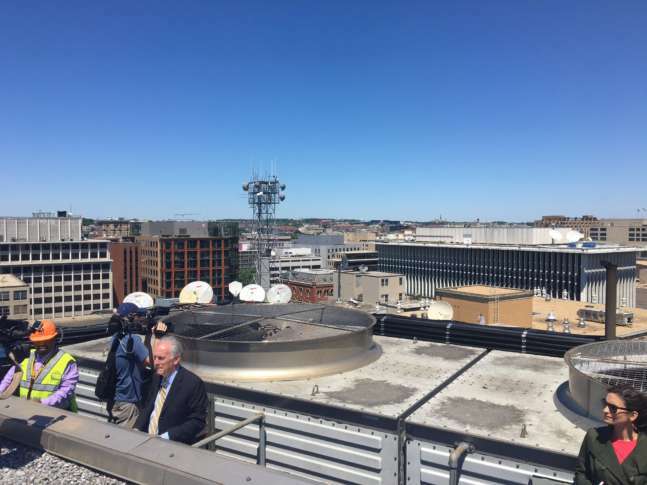 On Wednesday, Metro provided “additional information regarding possible locations” of the temporary cooling tower that last summer sat along Connecticut Avenue Northwest, District Department of Transportation spokesman Terry Owens said in an email. The details of each new location were not clear, but logistical constraints limit likely locations to the area bounded by 17th, K, 18th and M streets Northwest. “DDOT is evaluating the potential traffic and safety impacts of those options and will make a final recommendation to WMATA as quickly as possible,” Owens said. The temporary tower looks something like a large trailer with ventilation fans built in. It would connect to temporary pipes placed under Connecticut Avenue that would link it to the chiller plant just north of K Street Northwest. Last year’s location, which Metro used from late June through September, drew complaints about noise and reduced foot traffic at businesses. Riders at Farragut North and Dupont Circle were glad to stop sweating as much, though — the chiller system at those stations hadn’t worked for years due to leaky pipes that connect the permanent cooling tower on top of a building above the Farragut North station to a chiller plant under the middle of Connecticut Avenue. Metro typically activates its chiller systems May 15 each year. They circulate cooled water through pipes to somewhat reduce the temperature in stations during summer months. The pipes connecting the cooling tower and permanent chiller plant at Farragut North have been leaking since at least the summer of 2015. It is not clear when Metro plans to have a permanent fix in place.